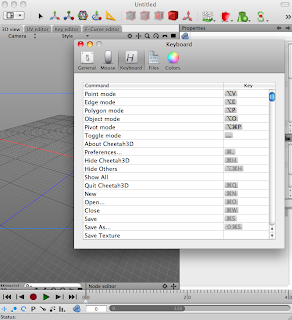 A beta version of Cheetah3D 5.7 was just made available by on the Cheetah3D forum. The main improvement is a revamped of the Preferences panel. Now you can map pretty much every program function and command, including scripts, to a keyboard shortcut. The program warns you when you are using a duplicate keyboard shortcut, so you're safe there. The only thing I would improve would be a better organization of the commands. Also, you can change the default color of many items (like the default specular,) which is a great addition with lots of potential. My personal favorite improvement is the ability to change the color of the frame that defines the camera boundaries. This function used to be a bit buggy (the boundary would disappear for no reason), now the bug is gone, and you can change the color of the boundary as well. Here is a screenshot of the new version. the panel where you change the keyboard mapping.